Lawn Love is a network of the best lawn care companies consolidated under one consumer facing brand. Our platform gives customers instant, accurate quotes online without an on-site visit, and routing efficiencies help companies make more money while customers pay the same. Payment and scheduling are automated, and customers can manage everything from their phones. We are Lawn Love, and we're bringing lawn care into the 21st century. 2 Customer retention rate is nearly 93%. 3 Americans spend $76B on lawn care every year. 7 Y Combinator Summer 2014; Raised 1.8M in seed round. 8 Select investors: Alexis Ohanian, Launch Capital, Bodley Group, Jared Friedman. Founded 1st company at 16. Sold 100% bootstrapped on-demand cleaning services company Golden Shine in 2012. Y-Combinator alum. My mother has complained about landscaping services for years. They're never on time, she skips work for quotes, has to pay with a check, and the work quality is subpar. It’s a bad experience.Lawn Love provides a better experience at the same price and is more profitable for lawn care companies. They can even open new markets without anyone on the ground locally and just a few thousand dollars in marketing spend. That’s why they’ve been growing so fast.Most importantly I’m extremely impressed by Jeremy. He knows their business as well as any founder I’ve spoken to. He started his first profitable company at 16 and later bootstrapped and sold an on-demand home cleaning platform. I'm all about building brands people love (reddit, hipmunk) and Lawn Love is well on their way to something really special in an industry thirsty for an amazing product like this. Reddit Founder. Partner at Y Combinator. Lawn Love is the new vertical marketplace to unbundle Craigslist's monopoly on local for outside residential services. Jeremy jumps out at you as an outlier entrepreneur with a life story that equips him for success in this endeavor. Serial investor with multiple exits. Jeremy is a serial entrepreneur who uses his brain and automation where others only throw money and man-power at problems. Being a hacker and hustler at the same time, and having successfully built and sold the Southern California Homejoy play, Jeremy knows exactly what is important to make Lawn Love work. Founder and CEO of be2 and C-Date, a profitable $60M+ business. Y Combinator Partner. Founder Reddit, Hipmunk and Breadpig. Author and Serial Investor. Venture capital firm dedicated to seed stage funding for all types of businesses. Bodley Group seeks superior returns through investments in private companies with favorable positioning in niche markets. Scribd co-founder and angel investor in numerous Y Combinator companies. As its name suggests, Lawn Love provides customers with an easy way to get their lawns serviced, offering mowing, fertilization, aeration, seeding, and yard cleanup. But its real value proposition for customers is that it provides a quote right from the site (no need for a surveying meeting), handles the coordination with lawn technicians, and above all, saves consumers from having to do the research themselves. Lawn Love has built a web platform that works as a two-way marketplace with the aim of bringing more efficiency and protection to both sides of the business transaction. Product shots and market size. The lawn care industry has been untouched by software. 480,000 lawn care companies did $76B in revenue last year with almost no software to make them more efficient. We are consolidating them all into one consumer facing platform that sources more business for the good companies at a higher hourly rate, and give homeowners a dramatically more reliable and easy to use experience. We’re already in 21 markets, and soon lawn care pros nationwide will use us to manage all their sales and operations. Can you outline how a homeowner currently finds lawn care and how you help to solve this headache? The two primary pain points for consumers are: 1) the initial search process and 2) ongoing service quality. If you're looking for a lawn pro today you'd probably start by going to Yelp, Craigslist, or the Yellowpages. From there it takes days, multiple phone calls, and an in-person appointment just to get a quote for your yard. The search process is slow and time consuming. Once you finally find someone, they will tend to do good work for a few months before invariably spending less and less time on your property as they shift focus toward newer customers. Service quality degrades over time, until eventually you get frustrated and set about looking for someone new. This cycle repeats ad nauseam. 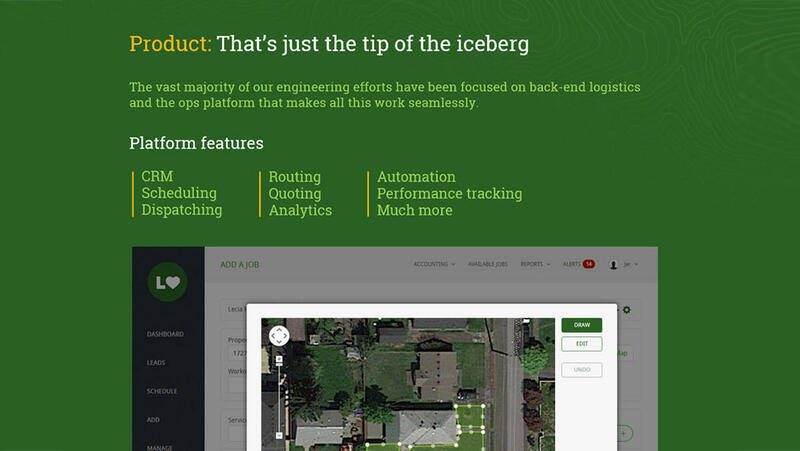 Our solution: We built satellite mapping tools that allow us to measure the square footage of your yard, and provide you with a highly accurate quote in under two minutes. We never have to set foot on your property. We've also built a back-end platform that handles everything from routing and dispatching to payments, scheduling, and provider communication. 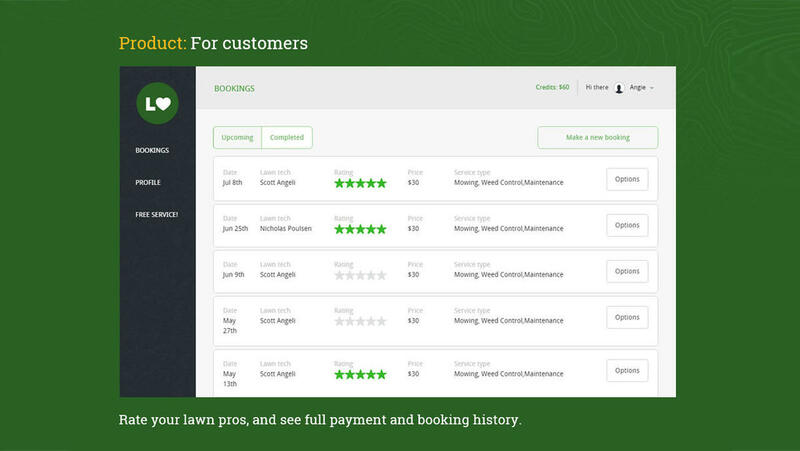 We pair this with matchmaking models that allow us to not only find the best lawn techs in your area, but enable them to perform even better using the lever that is software. The result is a fundamentally better lawn care experience, rendered into its most simple, seamless form. We think this is what lawn care should look like in the 21st century. How fragmented is the market? Why hasn’t it consolidated at all? There are 480,000 landscape management companies in the U.S. and 975,000 lawn workers. Churn is endemic, and quality is all over the map. It’s difficult for companies to keep customers happy when they constantly feel the need to chase new business. Also, 480,000 companies means 480k owners. Even the biggest companies like Scotts Lawn Care have a hard time convincing all these people who work for themselves to start answering to a boss. No one has been able to capture a double digit share of this market. We built software that preserves company control and empowers owners to run better operations. 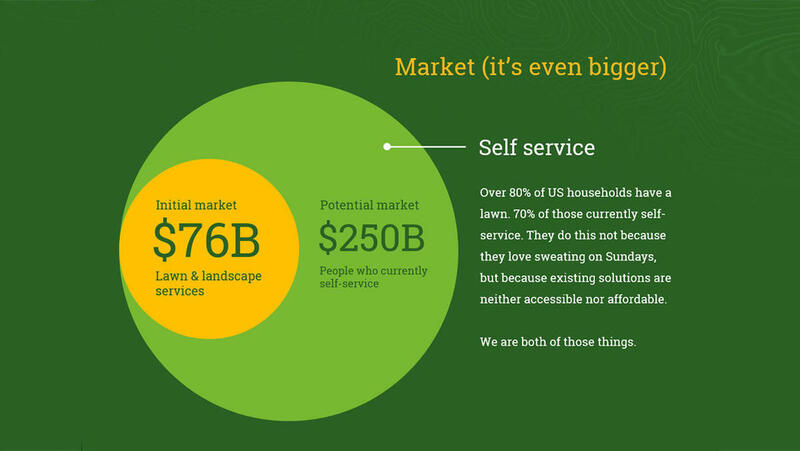 By sitting in between homeowners and lawn services we are able to consolidate this $76B industry on one platform than benefits both consumers and companies alike. How does the Lawn Love price compare to just finding a service myself? We price according to the local market average. Then rely on the fact that our service is so much better than the alternative to compete with the lowest price options. We’re not focused on being the cheapest option even though we could. We’re selling convenience and high quality service and our fast growth suggests we can keep charging the way we do. Our users have yards and houses in the suburbs - so our demographic skews a little older and wealthier than other services like house cleaning. The age demographic is 30-60 years old in cities like Indianapolis, Louisville, and Omaha. Our target cities haven’t been exposed to all the on-demand options you have in cities like SF and NYC - there’s less fatigue and all our users are actually really excited about this novel technology we’re providing. What problems do lawn care providers have and how do you solve them? Lawn care providers are exceptional at their core competency but not particularly good at the menial work of running a business. These companies often consist of a couple hardworking individuals who just want to focus on quality lawn care rather than marketing, scheduling, routing, payment processing, website design, etc. We take all this work off their plate so they can focus on what they love and do best. We advertise for them, we schedule and route our lawn providers efficiently, we handle payment processing with customers, and provide a great website for customers to book online and companies to find all the business they could want. These companies actually make much more money with Lawn Love than they would have on their own. Rather than spend half the work week beating the pavement to solicit new customers, we send them a full schedule so they can work for pay every single hour of the week. We also use batching algorithms to consolidate jobs by area so our companies can fit in twice as many jobs per day as they used to on their own schedule - earning twice as much money while burning much less gas. We deposit payment for every job 48 hours after it’s complete so these companies have consistent cash flow for the first time ever. We provide so many minute optimizations that just make our lawn professional’s lives much easier. Lawn Love handles all the headaches of running a small business so that these mom and pop operations can focus on what they do best and make more money. 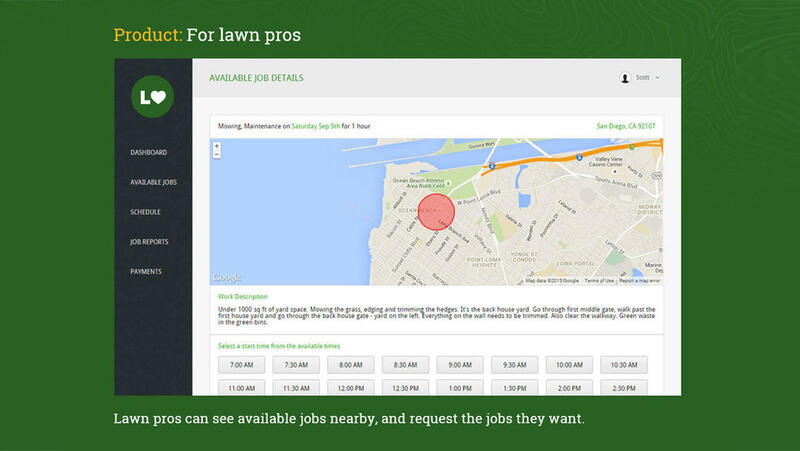 How are you finding the lawn professionals? What are the important qualities in a good lawn tech? Our onboarding process is a big part of why our product is so compelling. We’ve built models of what the best lawn techs look like so we’re able to select the best professionals from Craigslist, Yelp and Google with little human effort. Then we have a ton of qualitative and quantitative metrics like ratings, reviews, and tier-based compensation to ensure quality starts and remains high. Experience is trumpeted in the industry as the most important factor for a good customer experience but it’s actually reliability that translates to high customer reviews. Consistent and effective communication is our number one criteria. Incumbent providers: The vast majority of players in the space are small-time, mom-and-pop style companies, none of whom are particularly tech savvy. These folks are actually a great fit for the supply side of our platform, as we're able to bring them a steady stream of work, while taking care of all the customer service, accounting, and other meta-work around running their business. There are also a few large national firms like TruGreen, ValleyCrest, and Brickman, none of whom hold more than 1-2% of the market. The 10 largest companies have collectively captured less than 10% of the total market. These companies suffer significant cost-structure disadvantages, and are rather low-tech offerings. Other startups: There are a few other startups pursuing something similar / adjacent to us: These are companies like LawnStarter, Robin, EzHome, and TaskEasy. As far as we can see, we are both moving faster and have better unit economics than any of these companies. We believe this is a direct by-product of us having already built and scaled very similar businesses. We have the scars from hitting all the common obstacles inherent to these sorts of human-driven operations, and are able to move quickly as a result of that experience. How big is the market? How do you decide which cities to expand into? 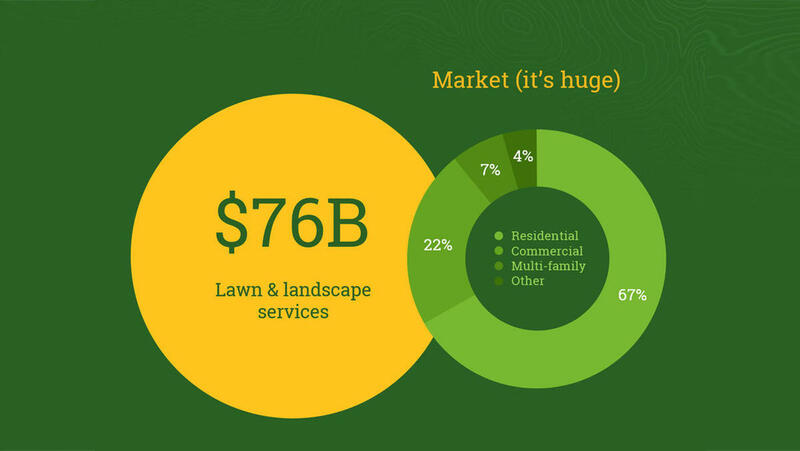 Lawn care is a $76 billion industry in the U.S. alone and only 30% of lawn owners actually outsource their lawn care. 70% of homeowners still do it themselves either because they enjoy mowing their lawns or it’s too painful or perceived as too expensive to find outside help. That $76 billion spent annually in the U.S. breaks down to 67% residential, 22% commercial, 3% multi-family and 7% government. Right now we’re almost explicitly focused on the residential piece of that pie. Some high profile on-demand companies like Homejoy have gone under recently. Can you discuss the on-demand space in general and why lawn care might be different? 1. We have better unit economics. We have strongly positive gross margins, vs reportedly negative gross margins for Homejoy 2. Our market is twice the size of house cleaning. 3. Our churn is far lower. Homejoy had 20% monthly subscriber churn, vs 7% for Lawn Love. Our retention is already 3x better, and we've invested far fewer resources in product, operations, and tools to drive retention (they deployed $40M vs our ~$1M to date). Not only is our current retention great for an on-demand company at our stage, there are lots more bullets we can fire to improve this further. 4. More homogeneous supply Lawn care is both less intimate and subjective than something like cleaning or babysitting. This reduces matchmaking difficulty, rendering the supply far more liquid. 5. Customer satisfaction is far higher. Our NPS is over 60 with a high confidence interval. 6. Services take place outside the home, and our customers are rarely present for the work. This is significant, as it reduces logistics friction, disintermediation risk, and boosts the value of our platform as a means of managing your service. 7. We're far more capital efficient. Yard care is obviously a seasonal business but we’ve still averaged 45% month over month growth since launch 18 months ago. In the winter our numbers fall below 30% because our northern markets pause service while southern cities slow from once a week to bi-weekly to save money when plants aren’t growing as fast. This time last year we were in 3 markets and now we’re in 21 cities across the country. We’re also increasing revenue faster than we’re increasing bookings which means our average revenue per customer is growing – an excellent sign for service quality and customer satisfaction. Do you foresee expansion into any services aside lawn care? The most obvious next step is snow removal and winter property care. The problem with snow removal is the demand spikes so much, everyone needs service at the exact same time. Right now we’re 100% focused on lawn care and next year we’ll turn some focus to solving the supply problem in snow removal. As you look back, what has your biggest challenge been so far? What will it be going forward? What do you still have to figure out? Our core challenge hasn’t changed since we started: finding consistent, reliable and communicative service providers so our customers get the best experience possible. Seamless booking and payment don’t matter if you walk out your door to a poorly cut lawn or worse the lawn guys just don’t show. The lawn pros are the core of our product and figuring out how to consistently find the best in every market and ensuring they remain reliable is our core challenge. Lawn Love is conducting a Regulation D offering via Wefunder Advisors LLC. CRD Number: #167803. I've found their service to be nothing short of awesome. It's easy to book, and they have been responsive to any feedback. I've gone through a variety of other lawn care providers, and only wish I'd found Lawn Love sooner. Thanks for vouching for Jeremy! If you'd like to invest in Jeremy, please open an account. We'll waive your fees if you do it now. We asked Jeremy for 10 personal references. Can you vouch for Jeremy?